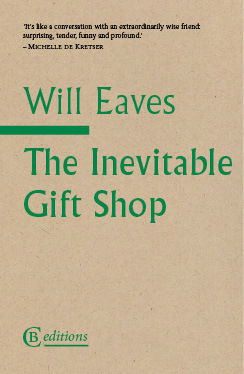 In the second instalment of our Ted Hughes Award ‘How I Did It’ series, Will Eaves explains the creative process behind ‘The Lord Is Listenin’ To Ya, Hallelujah’ from his shortlisted work The Inevitable Gift Shop. A memoir by other means, The Inevitable Gift Shop lassoes consciousness, memory, desire, literature, illness, flora and fauna, problems with tortoises and cable ties, and brings them back home in double file, as prose and poetry. It is published by CB Editions. If memory serves, I was trying to write a poem about the middle reaches of Sydney Road in the Melbourne suburb of Brunswick, where the shops and butchers and Turkish cafés and semi-abandoned bridal boutiques face each other across a patched and uneven surface clogged with traffic. Trams clatter up and down the street as they have done for more than a hundred years. The late Victorian buildings, many of them, retain their coloured plaster facades, like cake-decorations with pink and brown piping. The more I looked at them, the more they refused to obey what Thom Gunn has powerfully called the “occasions” of poetry, which are not decisions to write so much as a sorting of real and imaginary experience in which one must be alert to the happenstance, the inner prompting that presents itself as a found object or an unexpected idea. I’d injured my back and was in a fair amount of pain. Helpful distractions included the energy and beauty of my surroundings, the birdlife, the markets, the sounds of flyscreens slamming shut in the wind, the kindness of the people I met, the Polish lady on Lygon Street who took me under her wing, the odd way in which my relocation to Australia had both banished and revived childhood memories, because of course memory is dynamic – a conversation between past and present in which the retrieved event serves the needs of one’s current predicament. Memory is meaning in search of form. That search is a treacherous thing in both prose and poetry. Too strenuous an attempt to fix the results on the page can produce something aggressively personal or inert – the writer getting in front of the camera or in the way of a more unresolved and therefore interesting image. But if you can slide past a declared aim and speak in an aside, then the “adventures in writing” (Gunn again) can begin. I am taken with the notion of asides: they are, in early modern drama, the formally informal convention whereby people – liars especially – let slip the truth. I write a lot of them. They are part of the flow of a scene or narrative, but relatively unplanned, quickly ushered in. When we find ourselves digressing or speaking in asides, we are often saying what we really think but would be embarrassed to own. There is something Proustian about even the most trivial examples. It is almost as if we can tell the truth only when it doesn’t matter. This is by way of introduction to a poem I wrote, unusually for me, with few corrections. It is somewhere between an aside and a soliloquy, and there is plenty in it that strikes me now as peculiar – that “helium-filled Titanic”, for instance. But the strain in the image is part of the overall sense of unburdening that came with staring at the shop-fronts on Sydney Road, and the heart of that staring was a revelation of indebtedness. I wanted to tell my father, who loves listening to music, how much his example has meant to me. I listened to music as I walked up and down Sydney Road, and for a while I listened every day to the American jazz composer Carla Bley, whom we both admire. I associate her gospel instrumental, “The Lord Is Listenin’ To Ya, Hallelujah!”, with Dad, with Melbourne, with the smell of meat in Brunswick market, with the dramatic monologues of U. A. Fanthorpe and Billy Collins, with the Psalms of thanksgiving. Find out more information about The Inevitable Gift Shop and buy the book at CB Editions.